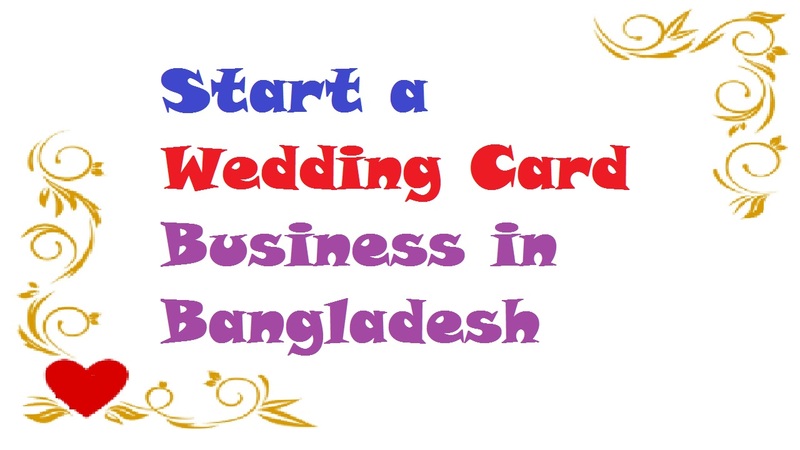 Are you thinking to start a wedding card business in Bangladesh? But, confused somehow? Let’s make you relaxed of your stresses by solving all of your potential issues of this concern. As you’re thinking, many people are looking for wedding and invitations card with a personal touch for their events. And some of them are turning to professional wedding card designers and printers for help. When you consider joining this business, it requires creativity and style. But, if you want to correctly set up the wedding card for printing, it requires some software and technical experience. Besides, it’s a great business that you can start either from your home or from a storefront location. For each client, it can be pre-designed templates or custom designed. Whatever it be, it’s nothing impossible for you. Because the wedding is an occasion in the country, it creates a good market for various wedding essentials. This is because the possibilities of wedding card business in Bangladesh virtually endless as a creatively inclined person you already know. With the growing economy, there is a great demand for the various events’ items like a wedding card. It’s a wide use from invitations embellished with peacock feathers to the intricate bejeweled ones. The magical spell of invitation cards is quite unblemished because a recently developed trend instigates people to send invitations online. That’s why there is a strong need for two strong factors of your matchless creativity and a strong market. Besides, although it’s the first thing that announces the news of the wedding, it silently announces the tone of the whole occasion. Consider the prospective market on the basis of competition and entry barriers when you are looking to determine your niche in wedding card business in Bangladesh. The first option is that where there is not enough competition and supply that can meet up with the customers’ demands. Also, you have the option to create it on your own by bringing into life new ideas and products or you can choose such products. Although you cannot expect your users to buy the goods immediately, it would create a new demand for the newly developed well. In order to monitor monitoring the activity of the prospective customers, you’ll have to consistently monitor your innovation. And as per your observations, you’ll have to be very patient and take speedy actions. When you make a business plan, it should include some specific and detailed things. These include an overview and description of your business, the research information on the market and competition, a description of your products and services, your budget, location, equipment and marketing plans. Not only giving you a reference to work from as you move through the steps but a business plan will help you focus your ideas for your business as well. On the other hand, find out where your skills will best fit performing the market researches. Also, if you focus on any particular niche of invitations then you must decide it. The wedding card business is vulnerable to some weaknesses like any other business. This is because it’s important to know your weaknesses and find out their potential solutions. But, your business is going to suffer in the coming time if you have any immense loss that can’t be expressed in words. Also, once upon a time, you’ll hire someone new and this is how the whole world moves. However, you are heavily dependent on the person who had helped your business evolve to reach success when it comes to something creative. Moreover, select their choicest stuff and purchase it is contrary to any other business where people come with a demand in mind. Your next target would be to advertise your business when everything has fallen in their places. For this purpose, use some customized banner printed and get it installed in the locality. You should it out besides seeking the aid of the print media, television commercials and distributing leaflets because it’s the cheapest mode of advertising. Moreover, if you want to get some referrals then you may advertise in the leading wedding magazines and send emails to wedding planners and stationery stores. Besides, you can use the social media to share your posts, which are free to do. What you need to do is simply add some images of your nice wedding cards those you have worked previously. It must be determined by taking into account various aspects so this is one of the most important considerations for wedding card business. Not only this business but for most of them a perfect location is vital for business development. And you can opt to rent or apply for loans if you’re able to bear such a huge upfront cost. Just keep in mind that the location of your store is a crucial factor in this business.